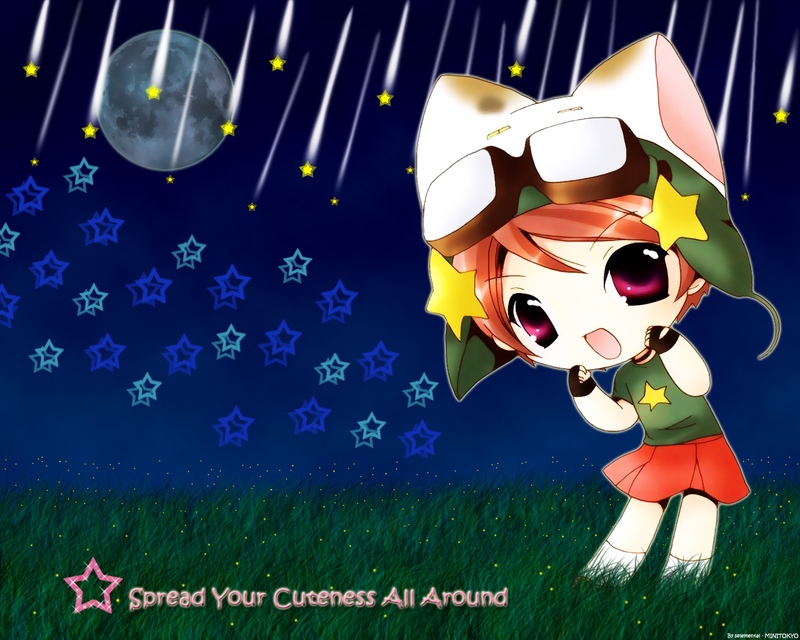 Di Gi Charat Wallpaper: Spread Like Shooting Stars - REMADE!! Minitokyo »	Di Gi Charat Wallpapers » Di Gi Charat Wallpaper: Spread Like Shooting Stars - REMADE!! XD Hello! My 1st wallie, "Spread Like Shooting Stars" had to be qurantined! I could then see where & how I went wrong! But I cannot take all the credit. as to lend me ideas on where and how to improve the wallie! or not XD so... But thank you! So this wallie is for FRIENDSHIP! The layers I had were more than 15. I forgot to count, sorry, yeah? or everything was just too STINKEN BIG! Hope you enjoy the wallie! I'm so happy you like it, yeah! Ahh ~ It's ur first wallpaper :D Look really nice. and the effect of the moon is just too much, I guess probably is too much on smart blur? I hope I didnt offend you, you did very good job on ur first wallpaper.